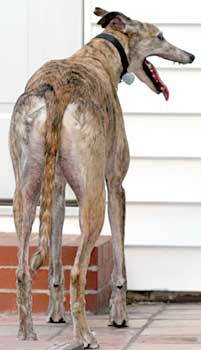 Conchee, aka Conchy Girl, is a beautiful 9-year-old brindle female, born April 1996. Conchee's sire is Mi Designer and her dam is CC Sassy Sis. 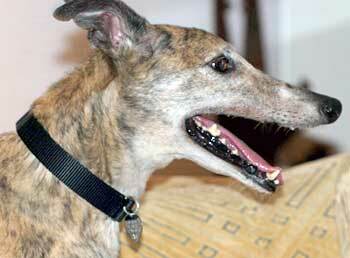 She has had quite a road leading up to her retirement, and it is about darn time for her to find her forever home! Conchee's racing career, consisting of 169 races, started October 2, 1998, at the Palm Beach, FL track, where she was the winner of the 1998 Palm Beach Iron Dog Triathlon, and ended at the same track on June 9, 2000. 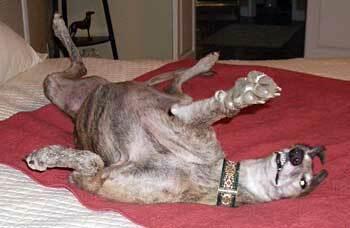 From there Conchee went on to her brood career delivering three litters - the first was sired by the famous Greys Statesman producing 7 greyhound pups in April 2001. 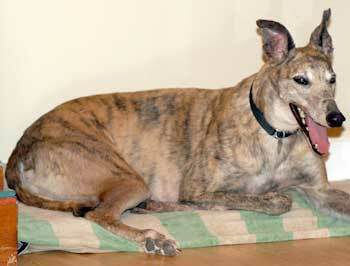 Her second "family" was sired by another famous greyhound, Craigie Whistler, producing 10 pups in April 2003, and her third, also by Craigie Whistler, consisted of 7 pups delivered in December 2003. From there she went on to be a blood donor. This sweet, affectionate girl has given, given and given of herself. Isn't it time for something to be given back to her? Conchee loves people and is very, very outgoing...and don't think she doesn't still run the oval track when she is out in the yard - she can romp and play with the youngest of them! It is not known at this time if Conchee is cat tolerant, but she is living in a foster home with two small dogs. Conchee is just a lovely girl. She is very affectionate and wags her tail constantly. Conchee is calm in the house, but outside she runs and plays with my dogs like a 4 year old. Except for the grey in her face you would never know she is 9 years old. She sleeps on her dog bed beside my bed at night and goes willingly into her crate when I leave for work. She is housebroken, not a barker and gets along with all my dogs. (I have Grey's, Dobe's, a Standard Poodle, a Wire Fox Terrier and a Shih Tzu.) If I didn't have so many dogs already Conchee would never leave my house! She would be a perfect addition to your home. I do think she would like the company of another dog or two.